ECB students are campus leaders—in student government (GCSA), as residence advisors, in Orientation, and in ministries on- and off-campus. 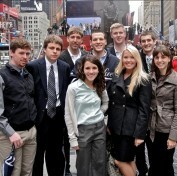 The student-led Economics and Business Organization hosts parties, speakers, and an annual trip to NYC and Wall Street. Faculty and students work closely together—1-on-1 in advising, in student research, in discussing ideas from classes, or simply reviewing course material together. 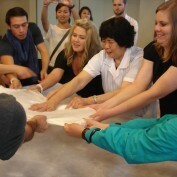 Hosted by Gordon College in January 2015, this conference successfully drew together scholars and practitioners working on different aspects of the economics of global poverty, from theoretical to empirical work, at macro or micro scales of analysis. To see an overview of the discussed topics and presented articles, please view the Economics of Global Poverty Program below. The articles presented are available in the Fall 2015 Issue 66 of Faith & Economics. 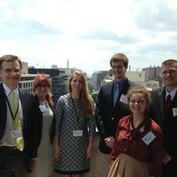 Five ECB students—Libby Gronbach, Dan Hurley, Juliann Booth, Hannah Scaer and Austin Drukker—traveled to Washington, D.C. in early June for the American Enterprise Institute’s Summer Conference. There were 91 college students and more than 30 faculty participating, all of whom heard from and engaged with distinguished AEI researchers on current U.S. policy issues ranging from unemployment to immigration. There were also helpful panel discussions on employment and internship opportunities in Washington, D.C.
China Seminar 2013 returned to the United States in mid-June after an intensive 19-day study tour. 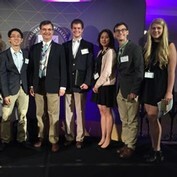 Fifteen Gordon students led by Prof. Stephen Smith, along with students from Biola, Westmont, and Hope, traveled more than 2,000 miles within China from Shanghai to Beijing, Chongqing, Shenzhen and Hong Kong. They visited—and interacted with leaders at—businesses and factories, universities, churches, and social service agencies. They also visited celebrated sites of Chinese history and culture, including the Great Wall, the Forbidden City, Tiananmen Square, the Da Zhu Grottoes, and many others. The Economics and Business Department anticipates offering the next China Seminar in 2015, its fifth since the program began in 2005. Amber Joy Fiedler: Economics and Business Leadership Award for strong academic performance, Christian character, and outstanding leadership in a variety of venues on campus. Brian Johnson: Distinguished Accounting Student Award for Christian character and the highest grade point average among accounting students. Joy Jeon: Distinguished Business Administration Student Award for Christian character and the highest grade point average among business administration students. Joshua Alvera: Distinguished Finance Student Award for Christian character and the highest grade point average among finance students. Jesse Laniak & Daniel Pfistner: co-winners of the Distinguished Economics Students Award for Christian character and the highest grade point average among economics students. 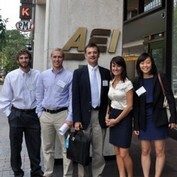 Four Economics and Business Department students traveled to Washington, D.C., for a conference at the American Enterprise Institute on the theme “Purpose & Prosperity: Exploring the Confluence of Faith, Economics, and Public Policy.” Jordan Frank, Russell Hawkins, Joy Jeon and Julia Marra were in the nation’s capital June 6–9 to meet with AEI’s distinguished senior fellows. This invitation-only event, with full scholarship support, honors outstanding juniors from around the country. 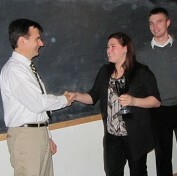 Natalie Giordano, Ben Check-Davis, Matt Gibson and Jon Van Dyne (not pictured) accept congratulations from ECB Chair Prof. Smith after their team wins the fall award for best marketing plan in Prof. Alice Tsang’s course, ECB 277 Principles of Marketing. It wasn’t all work for the Gordon students visiting New York City last spring as part of the EBO-organized trip—sight-seeing beckoned between more formal events.